Creative Spark Center for the Arts presents its’ highly anticipated annual fall fundraiser, Art on the Beach & Chefs in the Kitchen on Sunday, Nov. 10, from 1 to 5 p.m. This afternoon tour of Sullivan’s Island homes and studios features over 25 artists selling their creations along with chef demonstrations and tastings. Art on the Beach & Chefs in the Kitchen poster artist Carol McGill is an “experimenter with a distinctive style” who owes her inspiration to the inventive imagery of Matisse, the plein air subtleties of Monet, and the high contrast color creations of Van Gogh. 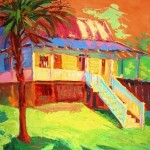 Carol’s use of lush oils, which she manipulates with a knife or brush, creates a work of passion and movement. 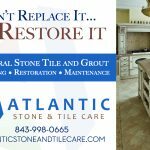 Her work has won her several prestigious awards, including 2011 Best Local Artist by Popular Voice and 2009 and 2010 Piccolo Spoleto One Woman Show awards. Patrons can earn a commemorative glass by spending $100 or more on art and enjoy bottomless champagne all day at Salt at Station 22. Or attend the “Toast the Artists” reception from 5 to 7 p.m. at the Island Club with a cash bar and desserts. Other participating restaurants are Old Village Post House, the Co-op, Amuse, Henry’s Crab Cakes, Joe’s Catering, Everyday Gourmet and Chef Jane Smith. Sponsors of this event also include Sandpiper Gallery and InTown.com. 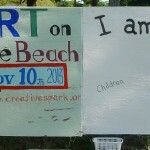 Art on the Beach & Chefs in the Kitchen benefits Creative Spark Center for the Arts, a private not for profit multi-disciplinary art center located in Mount Pleasant. Its mission is to provide high quality arts education to all who seek it with a philosophy that everyone has a creative spark and that learning the arts should be FUN! It serves over 400 students each week ranging from newborns through adults including summer camps, and many classes in art, drama, clay and private lessons in voice, violin, guitar and piano. 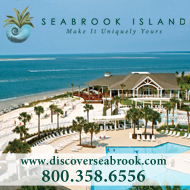 Call 843-881-3780 or visit www.creativespark.org for a full listing of programs. 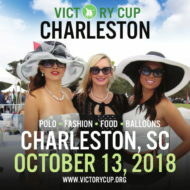 Tickets are $35 in advance or $40 the day at of the event at Battery Gadsden and are available online at www.creativespark.org, by calling 843.881.3780 or by visiting Sandpiper Gallery or Everyday Gourmet. This community mural near Battery Gadsden invites people to write what inspires them, as a prelude to the upcoming Art on the Beach and Chefs in the Kitchen fundraisers on Nov. 10.